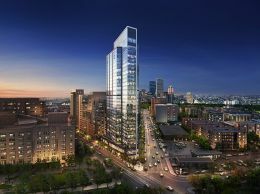 Modern 1 bedroom condo available close to bustling Kendall Square. New hardwood floors in living areas and bedroom, new tile kitchen floor, new appliances, new granite countertops, new bathroom sink and vanity. This is an inviting space with tall windows, high ceilings and a sensible floor plan. Closets are very generous for this size and style of unit. There are 4 closets in total - 2 have California Closet systems, one for linens and a large closet for the laundry, HVAC and hot water tank. The location is stellar, just a block from Kendall Square, a short walk to the Red Line T and loads of great coffee shops, restaurants and more on Cambridge Street. There is a garage parking spot and this unit comes with additional storage in the basement. The building is professionally managed and has an elevator. The information in this listing was gathered from third party resources including the seller and public records. Listing information provided courtesy of Bill Patterson of Craft Realty. MLS Property Information Network, Inc. and its subscribers disclaim any and all representations or warranties as to the accuracy of this information.